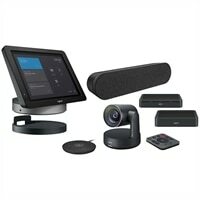 Logitech Smartdock Rally Solution With Flex For Larger Room Package For Skype RoomSmartDock, a purpose-built AV control console delivers convenience for meeting organizers and peace of mind for IT. SmartDock Flex simplifies cabling between the conference table and the front of the room while AV Passthrough allows for meetings outside the Microsoft ecosystem. The Rally video conferencing system further improves the video conferencing experience with its vocal clarity, whisper-quiet mechanical Pan/Tilt/Zoom, 15X HD zoom, 90° field of view, 4K sensor, and meeting automation, combined with Logitech’s RightSense™ technologies that automatically frame human figures and optimize color and luminance for human faces.